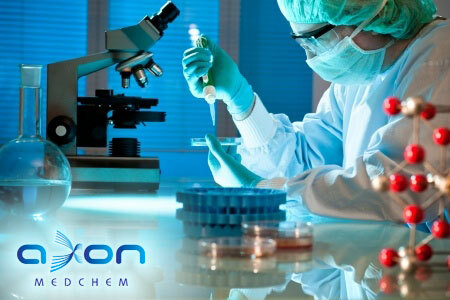 Axon Medchem is a leading European service platform for medicinal chemistry, spinned-off from Axon Biochemicals BV. Together with Axon Biochemicals BV, it conducts business operations as a contract research organization (CRO) in medicinal chemistry. Subsequent to the spin-off in 2006, Axon Medchem has developed as a prime source of high-value life science products, providing Axon Ligands™ for pharmaceutical research as world-wide recognized drug standards. Therefore, we aim to keep up with relevant scientific publications in order to serve potential customers with the latest advances in the field of the development of novel therapeutics for known diseases and pathologies like psychiatric disorders, oncology, Alzheimer's and Parkinson's disease, diabetes, inflammatory diseases, and many others. While the majority of the products we offer are synthesized in-house by well educated and skilled medicinal chemists, some are being supplied by research partners. Nevertheless, all Axon Ligands™ meet the high standards of quality control that are determined to guarantee the best quality of products among our competitors world wide, which is obviously well appreciated by our international clients. Besides the retail of Axon Ligands™, Axon Medchem is also specialized in contract research and high-quality synthesis of bio-active and/or drug-like molecules on the basis of contract research. The company aims to provide dedicated chemistry services on demand for pharmaceutical, (bio-)chemical, agricultural, and/or biotechnology companies as well as research institutes around the world. Drug design and synthesis, hit to lead development, and structure activity relationship (SAR) elucidation; we have accumulate the essential knowledge in front-line medicinal chemistry research to serve all of our customer requests. Please contact us for further information or special requests.